1/14 Japan Study Tour, National Taiwan Normal University, Tanimoto lab. 9/28-29 2018 International CSR, Sustainability, Ethics & Governance Conference, Taipei. 11/5 Meeting, National Taiwan Normal University, Taipei. 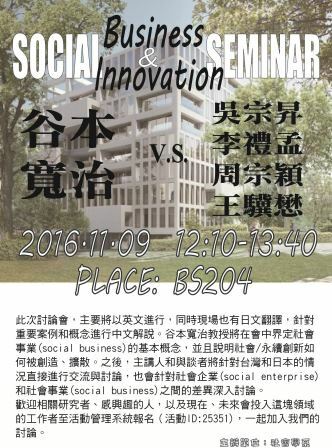 11/9 Seminar, College of Business, National Taipei University. 3/7　Special Lecture for PhD Candidates, Cologne Business School, Germany. 2/7 Seminar, Cologne Business School, Germany. 2/21 Lecture, Hamburg School of Business Administration, Germany. 2/27 Seminar, Copenhagen Business School, Denmark. 2/28 Seminar, MISUM, Stockholm School of Economics, Sweden. 11/20-22 Seminar, ESADE, Barcelona, Spain. 11/27 Meeting with Vienna Chamber of Commerce, Vienna, Austria. 11/28 Jury Meeting, Sustainable Entrepreneurship Award, Vienna, Austria. 12/5 Seminar, Graduate School of Economics, Rennes University, France. 12/6 Lecture, Graduate School of Economics, Rennes University, France. 7/8　JFBS Program Committee, Waseda Univ. 5/30 SKEMA KTO Research Seminar, SKEMA Business School, Sophia Antipolis, France. 6/6 Lecture, Deutsch-Japanishche Gesellschaft Berlin, JDZB, Germany. 6/20 Lecture, Japanisches Kulturinstitut Köln, Cologne, Germany. 6/24 Lecture, Hamburg School of Business Administration, Germany. 6/29-7/2 2017 Annual IABS Conference, Amsterdam, the Netherlands. 7/5 Workshop, Copenhagen Business School, Denmark. 9/14-16 7th International Conference on Corporate Sustainability and Responsibility, Humboldt Univ. 7/16　JFBS Program Committee, Waseda Univ. 12/12 JFBS Eastern Japan Workshop, Waseda Univ. 10/27 【Undergraduate Class】Business and Society: Guest Speaker, MITSUI & CO., LTD.
7/18 JFBS Program Committee, Waseda Univ. JFBS Eastern Japan Workshop, Waseda Univ. 6/27　JFBS Program Committee, Waseda Univ. 10/22　Seminar, Centre for Business in Society, Coventry Univ., UK. 8/14-16 International CSR, Sustainability, Ethics & Governance Conference, University of Surrey, U.K.
7/19 JFBS Program Committee, Waseda Univ. 6/21-22　Annual Conference, The Academic Association for Organizational Science, Hokkaido Univ. 4/24 Sustainability Conference, Huawei, Shenzhen, China. 7/20 JFBS Eastern Japan Workshop, Waseda Univ. 7/20 JFBS Western Japan Workshop, Kobe Univ. 6/15-16 Annual Conference, The Academic Association for Organizational Science, Senshu Univ. 6/29 Japan Academy of Business Administration, Kanto Division, Symposium "Globalization and Corporate Sustainability"
4/2 JFBS Workshop, Waseda Univ. 3/5 JFBS Eastern Japan Workshop, Waseda Univ. 3/22 Graduation Ceremony, Hitotsubashi Univ. 3/25 Graduation Ceremony, Waseda Univ. 9/1 "Sustainable Development and Multi-Stakeholders Process", ed. by Japan Forum of Business and Society, Sustainable Development and Multi-Stakeholders, Chikura-Shobo. 9/20-21 JFBS 2nd Annual Conference, Waseda University, Tokyo, Japan. 8/8-10 Tanimoto Seminar Summer Session, Isawa Hot Spring Resort, Yamanashi Prefecture. 8/17-19 The Certified Public Accountant Examination (Essays). 7/7 Seminar by Dr.Tapan Sarker, 13:00～14:30 Waseda University 11th Building, 4F at 1st conference room: "Transnational Corporations in the Extractive Industry Operating in Conflict States: How Far Should Corporate Citizenship Extend?" 3/16 Research Workshop, Japan Forum of Business and Society (JFBS) ,Marunouchi Building, Tokyo, Japan. 3/17 Keynote speech ,12th Annual Conference, Japan Academy of Strategic Management, Tokyo Fuji University, Japan. Osaka City University and Kobe University, Osaka. 11/17 "Social Innovatioin", keynote speaker, Executive Leaders Forum, Waseda University, Tokyo, Japan. 11/25 Research Workshop, Japan Forum of Business and Society (JFBS) , Marunouchi Building, Tokyo, Japan. 11/4-5 Fourth International Annual Conference, Asia Pacific Academy of Business in Society (APABIS), United Nations University, Tokyo. 5/14 Symposium ”Diverse styles of NPO activity: what is expected of civil engineers”, keynote speech, The Committee on Education , Japan Society of Civil Engineers. 5/25 Australia-Japan International Education Symposium, Knowledge and Skills for Sustainability, Australian Embassy. 4/20 Committee for Award, “Diversity Management 2009”, TOYO KEIZAI INC.
1/15　Lecture at College of Ministry of Land, Infrastructure and Transport. 1/23 Class 【Labor and Gender】"Corporate Social Responsibility and Gender Equality: Diversity Management." 1/29 Research at NPO Space Fuu. 11/6 “Socially Responsible Corporate Activity and Accountability", Corporate Management Committee, Kobe Association of Corporate Executives. 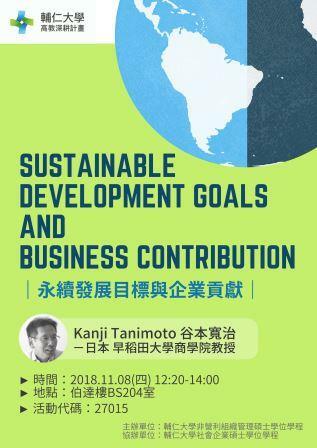 9/27　"CSR and Sustainable Development", Hitotsubashi University Open Seminar. 1/5 Tanimoto's profile added in "JK Who's Who" of Japan Knowledge, one of the largest collections of database resources about Japan by leading Japanese publisher, Shogakukan Inc.
12/26 Committee for Award, “Diversity Management”, TOYO KEIZAI INC.